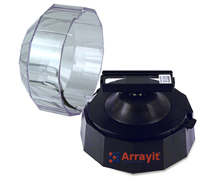 The ArrayIt® High-Speed Centrifuge allows rapid centrifugation of microarray substrates and slides. Simply insert a glass substrate or slide into the holder and press down on the lid. Wash buffers and other solutions are removed from the glass in 5-10 seconds, leaving the substrate slide in pristine condition for scanning. Available in 110-volt and 220-volt configurations, this product is a must-have item for any microarray laboratory.